We analyze the shape, size and condition of your eyelashes and add extensions. The staff has the highest quality skills and technology to advise you and give you the eyelashes that fit you and your eyes perfectly. In contrast to a “single lash”, which is when you add 1 extra lash, we use a technique of attaching 2 to 8 ultra fine extensions to your eyelashes, giving a better result to adding volume. If you haven’t given up on the idea of adding volume to your lashes, let us know and ask our staff to receive counseling and experience real results. 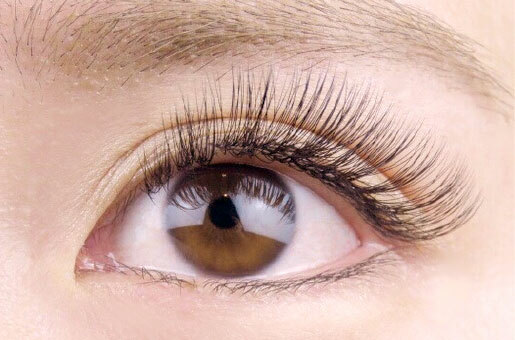 99% of the eyelashes are made up of protein called keratin, and that protein is made up of 18 kinds of amino acids. Eyelashes and curl are lost during daily cleansing causing damage to your eyelashes. By applying and supplementing high concentration amino acids when conducting eyelash perm treatment and before the disinfection of the extension, it is adsorbed into the cuticle and repairs the damage from the inside of the eyelash, resulting in eyelashes that attach firmly. We also aqua coat the surface of the eyelash which will reduce damage from the outside, producing a moisture balance for soft eyelashes that are flexible. Our color extension are done in easy to develop 3D color. We consult with you on the design while staying conscious of the contrast and color while bringing out the brightness of your eyes. We can also adjust for glamour and cuteness. Color you can enjoy while bringing your fashion up a notch.